A new UK-designed telescope that can map the sky much faster and deeper than any other infrared telescope has made its first release of stunning images. VISTA (the Visible and Infrared Survey Telescope for Astronomy) is the world's largest telescope dedicated to mapping the sky in infrared light and will reveal a completely new view of the southern sky. It was conceived and developed by a consortium of 18 UK universities led by Queen Mary University of London and including the University of Southampton, and is based at the European Southern Observatory's (ESO) Paranal Observatory in Chile. The Minister of State for Science and Innovation Lord Drayson, said: "This outstanding example of UK kit is revealing our universe's deepest secrets. I eagerly await more images from VISTA, which builds on our reputation as a world-leading centre for astronomy." A second image is a mosaic of two VISTA views towards the centre of our Milky Way galaxy in the constellation of Sagittarius (the Archer). Vast numbers of stars are revealed - this single picture shows about one million stars - and the majority are normally hidden behind thick dust clouds and only become visible at infrared wavelengths. Professor Ian McHardy, Head of the Astronomy Group at the University of Southampton and one of the VISTA co-investigators, says: "VISTA will have enormous impact on our understanding of both the very distant and very nearby universe. Southampton astronomers will use VISTA to understand the formation and evolution of massive black holes in the early universe which are found in deep X-ray and Gamma-ray surveys. 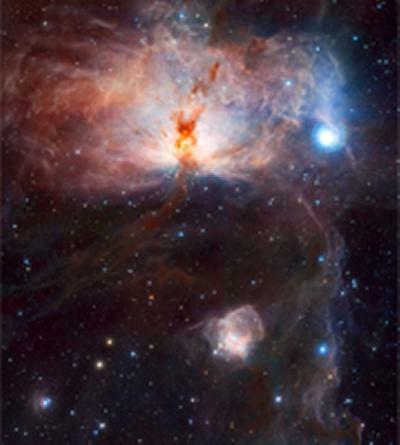 These sources are often highly obscured in visible light by dusty surrounding galaxies in the process of formation but can be clearly seen in the infrared by VISTA. We will also study stars and stellar mass black holes in our own, and nearby galaxies, which are also invisible optically. These sources can be highly variable in infrared observations but are not well understood." The telescope design and construction were project managed by the Science and Technology Facilities Council's UK Astronomy Technology Centre (UKATC). VISTA was formally handed over to the ESO at a ceremony at ESO's Headquarters in Garching, Germany, attended by representatives of Queen Mary University of London and STFC on 10 December 2009 and will now be operated by ESO. VISTA is a £37 million project, funded by grants from the DTI's (now BIS) Joint Infrastructure Fund and the STFC to Queen Mary, University of London, the lead institute of the VISTA consortium. VISTA is project managed by STFC's UK Astronomy Technology Centre.